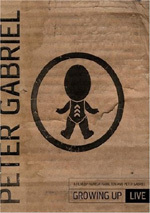 Peter Gabriel's impact on the music world is unparalleled. 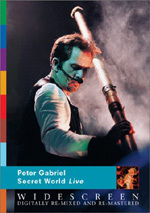 Included here in this DVD collection are the often outlandish video clips that have accompanied Gabriel's music over the years - 18 visually stunning videos that capture a truly remarkable career. Despite his innate quirkiness and his progressive rock origins, Peter Gabriel became a true hit-maker during the Eighties. Much of the credit for his success must go to his creative and innovative music videos. With clips like “Shock the Monkey” and “Sledgehammer”, Gabriel put his eye for visuals and innovation to use, and it reaped him great rewards. Some of the videos have appeared on videotape and laserdisc in the past, but not until now could we locate them on DVD. Called Play, this set packages 23 of Gabriel videos from 1977 to date. From Gabriel’s 1977 debut “Car” we get “Solsbury Hill”. The set skips 1978’s “Scratch” and jumps to 1980’s “Melt” for “Games Without Frontiers”, “I Don’t Remember” and “Biko”, though the last two don’t feature studio renditions. “Remember” is the take from 1983’s Plays Live, while “Biko” offers a live version featured in the 1987 flick Cry Freedom and recorded on that year’s tour. 1982’s “Security” solely includes “Shock the Monkey”, but we get tons from 1986’s commercial breakthrough So. It offers “Sledgehammer”, “Big Time”, “Red Rain”, “In Your Eyes”, “Don’t Give Up” and “Mercy Street”. As I watched the videos, I assigned each one a number on a scale of one to 10. Of the 23 clips, seven earned an eight or above. To these eyes, “Sledgehammer” and “Digging In the Dirt” are the cream of the crop. The former stands as one of the most creative, popular and witty music videos ever. 18 years down the road, it still looks fresh and it remains a blast. “Dirt” does an exemplary job in that it melds with the lyrics and tone of the song but it doesn’t just act out the words. Clever, quirky and a tad malevolent, it sticks with you. Four more videos earned nines. “Steam” and “Big Time” both feel somewhat like the children of “Sledgehammer”. Both are also funky tunes, and the videos use similar visuals. Nonetheless, they’re a lot of fun and they help bolster the tracks. “Shock the Monkey” was Gabriel’s first great video, and ala “Dirt”, it provides a dark jolt that connects well with the lyrics. Finally, unlike these other active videos, “Don’t Give Up” works due to its terrific simplicity. Gabriel and guest vocalist Kate Bush hug and sing as they spin to reveal the current crooner. It doesn’t sound like much, but it gives us a memorable illustration of the tune. Another track from So, “Red Rain” merited an eight. Happily, it avoids the obvious gimmicks: at no point does it rain in the clip, and only a smidgen of earthy red appears. Instead, the video sticks with moody dark tones and works with a somber sense that connects to the song. When I looked at the DVD’s clunkers, I found that I’d rated four of the videos with the three or lower. The worst clip in the collection comes from an excellent song: “Biko”. The video received a two due to its extremely heavy use of movie clips. We see a little of Pete on stage, but mainly it consists of film snippets, and those make dull. The other three underachievers each made a three. Both “Shaking the Tree” and “Washing of the Water” lose points due to their obviousness. What do we see in “Washing”? A long montage of water visuals. Yawn! “Shaking” basically just acts out the words as well, which might not be so bad, but Pete’s clunky dance steps make this one tough to take. Easily the package’s biggest disappointment, “The Barry Williams Show” also suffers from the “illustrated lyrics” syndrome. Already an obvious take on The Jerry Springer Show, what little subtlety existed in the words gets eliminated with the video’s obvious visuals. They needed Sean Penn to direct this dud? I hoped for much better, but the video lacked any cleverness or incisiveness. Obviously, the remaining 12 videos fall somewhere between these two extremes. Some of them fare well in one area but lose points in others. A few are consistently executed but simply bland as a whole. Despite the inevitable mix of ups and downs, I largely like Play. You’ll never find a truly consistent career-spanning music video collection, but Gabriel’s are probably as strong as anybody’s would be over more than two decades. And when they’re good, they’re excellent. 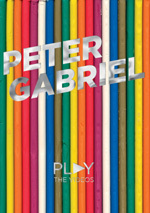 Peter Gabriel: Play appears mostly in an aspect ratio of 1.33:1 on this single-sided, double-layered DVD; due to those dimensions, most of the image has not been enhanced for 16X9 televisions. However, five videos did present anamorphically-enhanced visuals: “The Drop”, “I Don’t Remember”, “The Barry Williams Show”, “Kiss That Frog”, and “Solsbury Hill”. All of these were 1.78:1 except for “The Drop”, which was 2.35:1. In addition, “Biko” featured a lot of letterboxed movie snippets, but it also presented some fullframe material, so it wasn’t 16X9 enhanced. If you’ve read any of my other reviews of music video compilations, you’ll have heard me gripe about how tough it is to summarize picture quality for them. Music videos use so many extreme visual techniques and often intentionally look bad. In addition, when a package spans more than two decades like Play, we see age-related differences that make a uniform rating next to impossible. But that’s my job, and in the case of Play, I thought the videos looked surprisingly good. Music videos of the Eighties and even into the Nineties often suffered from a gauzy appearance, but that largely failed to materialize here. The clips showed consistently good definition and sharpness. They rarely looked tremendously sharp, but the avoided the usual bland fuzziness. Jagged edges were only a small problem, and shimmering caused no distractions. Edge enhancement didn’t interfere either; some haloes appeared - such as during “Don’t Give Up” and “Kiss That Frog” - but they seemed to stem from the various visual effects. Source flaws essentially remained absent. A few marks and other distractions periodically appeared, but not with any frequency. Colors depended on the style of the video, but the hues usually were strong. “Kiss That Frog” was surprisingly bland given its vivid CG origins, but then something like “Shaking the Tree” rebounded with lively tones. Overall, the colors looked fairly engaging and vivid. Blacks could go a little drab at times, but they mostly seemed dense enough, and the occasional low-light shot usually came across as reasonably well-defined. Don’t anticipate stellar visuals here, for this remained a package of music videos. However, within the constraints of genre and age, Play looked good and offered stronger picture quality than I expected. For Play, all the songs received fresh remixes to convert them to multichannel formats. The DVD presented both Dolby Digital 5.1 and DTS 5.1 soundtrack. Though DTS often gets the nod for musical presentations, I couldn’t hear substantial differences between the two tracks. Both sounded virtually identical. That was fine with me, for the audio of Play was uniformly excellent. Not content to leave things simply stereo, the songs offered highly aggressive use of all five channels. The forward channels still played the strongest role, but that occurred solely because of the lead vocals. Gabriel’s singing always stayed appropriately focused in the front center channel. Otherwise, the pieces spread out broadly across the five speakers. No one area dominated, as different bits popped up all over the place. Though this could have become gimmicky, it didn’t, and the impression remained natural and well integrated. As for the material from the front, those features blended together wonderfully well. The instrumentation seemed nicely localized but not excessively discrete, so the whole package melded together cleanly. The soundfield offered a seamless and natural presentation. The quality of the audio also seemed excellent. Vocals were fantastically firm and natural. They appeared very up front and concise and lacked any signs of problems. All instruments came across as accurate and fully developed. Highs displayed good bite and clarity, while bass response was deep and tight. All in all, the audio of Play seemed simply outstanding. Note that because all of the tracks were remixed for 5.1, some may not sound the way you remember them. For the most part, the remixes largely retained the elements of the original songs, but some of them took greater liberties. For example, “Big Time” and “Steam” came across as pretty different at times. Unfortunately, I can’t recall if these mixes matched those heard in the original videos. I do know that they vary when compared to the album versions of the songs, but it’s possible that the videos used alternate mixes. Anyway, while the quality of the audio remained uniformly excellent, I wanted to provide the disclaimer that these remixes did tinker with the original tracks to moderate degrees. The intros mix new comments from Gabriel plus archival remarks and notes from a few of the videos’ directors. We also see some behind the scenes footage, such as when Pete demonstrates the computer state of the art circa 1980. The intros provide general information about the songs, the videos, and the sessions. Some are better than others, but overall, they add decent background about the clips. Next we get a live version of Games Without Frontiers from 2004. Available with the three audio options found in the main program, this tune didn’t appear on Growing Up Live. The song appeared during Gabriel’s summer 2004 outdoor European tour. It’s a jerky music video style presentation that doesn’t work very well. Picture quality seems messy as well. The booklet claims it’ll be part of a DVD to document the 2004 tour; I hope it looks more natural there. “Nest” is more esoteric as it presents… well, I’m not really sure what it presents. It looks like the construction of a complex circus stage, but don’t quote me on that. It’s marginally interesting at best. I have no clue why neither of these shows up in the standard program. Perhaps the cue-ball Pete of 2004 can’t stand the sight of his bushy-headed self from 1977, but that doesn’t explain the omission of “Nest”; Pete doesn’t even appear in that clip. Three trailers finish the DVD. We get ads for the upcoming Family Portrait as well as Growing Up Live and Secret World Live. Portrait looks like an interesting glance behind the scenes of the 2002 tour. Finally, Play includes a nice 24-page booklet. It presents an introduction from Gabriel as well as various credits. When we look at the list of music video innovators, Peter Gabriel definitely deserves a mention. Play shows why, as its 23 clips offer a lot of quirky and memorable material with relatively few duds. 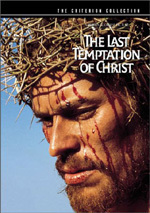 The DVD presents generally positive visuals with absolutely stellar audio and a few moderately intriguing supplements. I heartily recommend Play, for it acts as a good introduction to Gabriel’s music as well as a strong collection of ground-breaking videos.